Ajiaco is a Colombian potato soup. 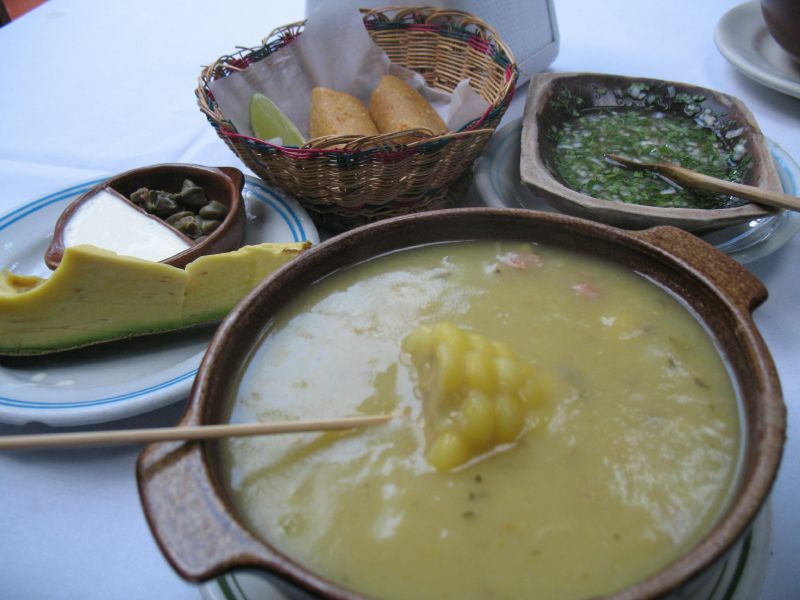 Although several regions of Colombia have their distinct recipe, the most famous is ajiaco santafereño, named after Santa Fé de Bogotá, the capital of Colombia, where it is a cultural mainstay. It typically contains pieces of chicken, large chunks of corn on the cob, two or three kinds of native potatoes (tiny papas criollas that fall apart and thicken the soup, and give the soup its characteristic dark yellow color; the waxy sabanera and/or the soft pastusa), and guasca (Galinsoga parviflora), a weedy, aromatic herb common in all America that lends the dish part of its distinctive flavour. The soup is typically served with heavy cream, capers and avocado, all mixed in just before eating in the proportions each individual prefers. Ajiaco is so heavy that it is usually considered a full meal. In the highly regional Colombian cuisine, this is most representative dish of Bogotá.